The Terriers turned the page on the calendar and greeted November with their first win, 5-2, at Providence's Schneider Rink with five players each recording their first goal of the season. 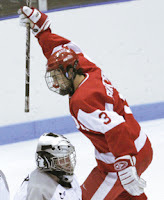 Kevin Shattenkirk's (Daily Free Press photo) goal early in the second was the first of his BU career. His blueline partner, Brian Strait, rebounded from a difficult time in Michigan to register two assists, while Brett Bennett was strong in the net, especially in the second period when BU took control of the game. The Daily Free Press has a pair of game accounts that include Coach Jack Parker’s take on the relative scoring outburst. USCHO writer Scott Weighart handled the site’s Hockey East column duties this week and talked with Jack Parker about the Terriers’ slow start this season in an article written prior to the Providence game. The “Red Hot Hockey” matchup with Cornell at Madison Square Garden is just three weeks away and it’s been reported that the game is a virtual sellout with only some nosebleed seats available. A sellout for hockey is 18,202 and, in a coaches’ conference call with the media last month, Coach Parker had suggested that if attendance reached 11-12,000, the event would be a success. That milestone has been well surpassed. The facility, which bills itself as “the world’s most famous arena” is actually the fourth Madison Square Garden with a new building being planned. When Jack Parker played in the Garden Holiday Festival in 1966—along with the famed "Pinball Line" of Herb Wakabayashi, Mickey Gray and Serge Boily—it was at MSG III. A concise history of MSG can be found here. The World Junior A Challenge doesn’t start until Monday, but in exhibition action, 2008 recruit Corey Trivino had a goal in the Canada East’s 4-1 win over the KIJHL All Stars, while recruiting target Derek Lee scored the game winner in Canada West’s 2-1 win.